Nikon has finally announced a new pro DX (cropped sensor) camera. The D500 features a 20.9 megapixel sensor with the EXPEED 5 image processing engine. It has Nikon’s new Multicam 20K AF system, a native ISO range from 100 to 51200 and UHD video at 30/25/24p frame rates. There is a thread developing on the Wetpixel forum discussing the camera’s new features. The 2015 Ocean Art contest has announced its results. Many congratulations to Jeff Milisen who was awarded Best of Show for his stunning super macro image of a larval cusk eel (Ophidiidae sp) shot during a black water dive off Kailua-Kona, Hawaii, USA. As always, additional congratulations to all those who achieved placings in the contest. Sony has added a new action camera to its line. The HDR-AS50 has an 11.1 megapixel sensor with an image stabilized Zeiss Tessar lens. It can record HD video at 50Mbps as well as 4K timelapses. The AS50 has a dedicated live-view remote and a 60m rated underwater housing (MPK-UWH1). At the CES show, Sony has announced a new 4k Handycam camcorder and two new HD models. The FDR-AX53 has a new lens and sensor with an enhanced A algorithm that provides 40% faster focusing. It has assignable manual functions and a bit rate of 100Mbps. The HDR-CX675 and HDR-CX455 are HD camcorders that have 5 axis optical stabilization. Borneo from Below has released their latest episode online. This week Bertie explores the world of parrotfish in Borneo. n a surprising move, Nikon has entered the action camera market. The KeyMission 360 can record true 360° video in 4K UHD and is equipped with “electronic vibration reduction” which “reduces the effects of camera shake”. It is waterproof to 30m (98 ft) without a housing. Nikon has announced their flagship D5 FX SLR. It has a 20.8MP FX CMOS sensor with the EXPEED 5 image processing engine delivering an ISO range of 100 to 102400. AF is via the new 153 point Multi-CAM 20K autofocus sensor module. Video is available on the new camera at UHD resolution at 30p, 25p, 24p frame rates. There are two versions of the camera available, one using two CF cards for storage, and one using two XQD. The 2016 Wildlife Photographer of the Year (WPOTY) contest is now open for entries. The contest will accept entries through until 25 February 2016. The results will be publicly announced at a gala event at London’s Natural History Museum. 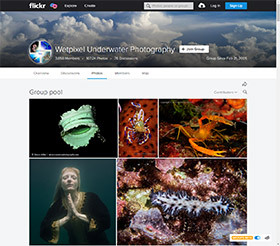 As is normal, the contest features an Underwater category.